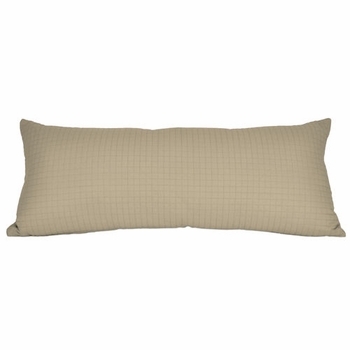 The Box Quilted Bedding Collection Bolster Accent Pillows feature a 1/2" x 1/2" box stitch quilting pattern on the front side and a solid plain reverse side. The bolster accents have a removable microfiber cover with a hidden zipper and are made from high-quality machine washable microfiber fabric. Measuring 12" x 28", the Bolster Accent Pillows are about half the size of a standard size bed pillow. Available in 11 solid colors that coordinate with the Box Quilted Bedding Collection items. Color available: Camel, Chocolate (Light Brown), Espresso (Dark Brown), Green Apple, Gray, Khaki, Moss Green, Nautical Blue (Dark Navy), Purple, Red Apple, and Teal Green. Available for wholesale purchase by the case of 6 pillows with Free Shipping.